This topic contains 18 replies, has 6 voices, and was last updated by Anonymous 5 years, 9 months ago. 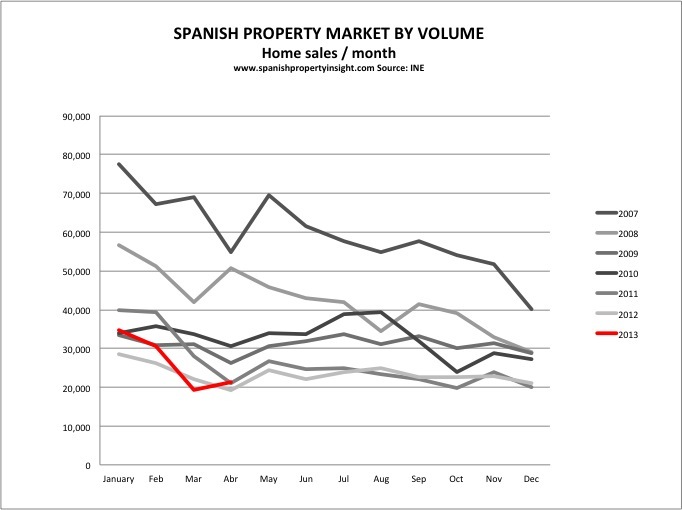 This thread is for all the data on Spanish house sales in 2013, in other words the Spanish property market by volume. Starting with the latest figures from the Property Register. They registered 100,768 homes sales in Q1, 22,487 more than the previous quarter (+29pc). But we know the increase was all due to the end of tax breaks bringing sales forward, so we also know that sales are going to slump in the next quarter. Overall, the fiscal changes will squeeze the market and reduce sales. At last the registrars have started breaking down sales by nationality in their quarterly reports, something they only did in the annual report until now. Foreigners made up 8.63pc of the market in Q1, up from 8.12pc in 2012, so the importance of foreign buyers continues to grow. The Brits were the biggest group (15pc), followed by the Russians on 9pc. Germans still staying away……. There were 23,642 registered property purchases made in April up almost 11% on April 2012 according to the Instituto Nacional de Estadística. This positive news comes after very poor March data which showed a 12% annual fall in sales. April’s figures demonstrate its highest monthly increase in purchases since 2009 when compared to March with a 6.8% rise. Here is the monthly breakdown of the INE house sales figures that are the best guide to where the market is heading (based on registry figures, so with some time delay). The market has recovered a bit after the fiscal-change-inspired collapse in March. It was the best April in 3 years for sales, though that’s not saying much. Year to date the market is still 10pc bigger than last year, which I believe will turn out to have been the bottom of the market in terms of sales volumes (but not necessarily in terms of value). ‘Tellingly it’s new build property sales which are taking the biggest hit’ due to the VAT hike. 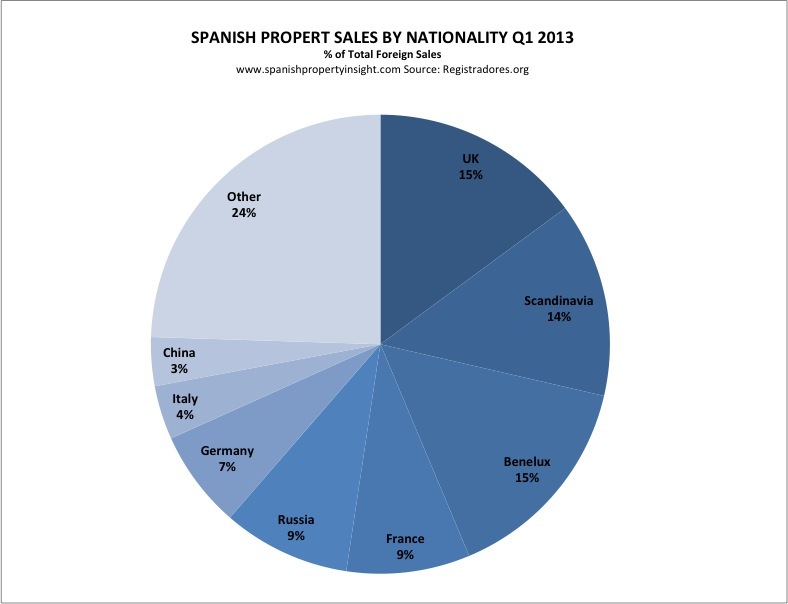 mg, agree there are so many markets, data bases in Spain so it’s difficult to know the truth. The most recent revelation by RR de Acuna & Asociados Madrid that numbers of properties for sale in Spain has risen from 2 million to 2.25 million was a shock. Data released by the General Counsel of Notaries shows a 12% rise in year on year sales in April. The number of houses sold in the month was 26,177 according to their statistics. I don’t understand Angies’s question – all sales get registered (both private and errr “public”) so they will show up in the data. 2012 ends with about 21,000 sales but 2013 starts with about 35,000. It implies a jump of about 15,000 sales in December 2012. I guess sales might have shot up with the impending fiscal changes but that’s one hell of a jump. After an 11% year on year rise in property purchases in Spain for April May’s data shows a 3.7% year on year fall according to the Instituto Nacional de Estadística (INE). The number of purchases rose 11.2% from April to May which is the lowest such increase for 3 years. The poor figures for May have been largely caused due to weak sales of new builds as purchases of resale housing rose 2.3% year on year for the month. After the rebound in house purchases recorded in April (12% rise), figures for May are negative showing a 1.2% year on year fall after 28,659 sales were registered for the month. This marks a return to contraction of the Spanish real estate market although still not as extreme as that which was observed during the first few months of the year. However there is a large difference evident in the performance of different areas of the Spanish property sector as new build housing purchases fell 45% while resale property purchases rose 21.7% year on year. Love it Chopera. You should looking for a career change !!!!!!!!! !